Not related to HUD editing but since the comp update whenever I install a custom HUD (that is updated) and launch the game, it is an abomination of the default HUD + that custom HUD. Never had this happen, it is extremely weird. I even verified files and nothing happened. how do I edit the light green bar that shows up in the casual lobby after a match that shows how far you are to leveling up? Is there a simple way to change the main menu background and loading screen backgrounds instead of replacing every map picture? I'm sure you can specify it to always load a specific one and just replace one map picture, but I wasn't sure. STOGEIs there a simple way to change the main menu background and loading screen backgrounds instead of replacing every map picture? I'm sure you can specify it to always load a specific one and just replace one map picture, but I wasn't sure. XenThePybrohow do I edit the light green bar that shows up in the casual lobby after a match that shows how far you are to leveling up? Try messing around with the values in 'event PvPRankLevelUpXPBar' in hudanimations_tf. It doesn't let me use the number keys to change weapons, and it never goes off either. LyreixDoes anyone know how to get rid of this? [quote=Lyreix]Does anyone know how to get rid of this? How can i disable this help window which stays in the middle of my screen during 5 minuts every new map ? I get the 'About Casual/Competitive' popup shown to me the first time I click on both modes after startup, checking 'Don't show me again' doesn't do anything. Can I make it so these windows do not appear at all? can I animate main menu buttons to shrink and instead of cutting off the image they make the image smaller? Is it possible to remove the dotted line, >> bit, class name, ect. from the equip screen? If so, what's the file(s) I'd need to edit to make all that crap go away? is it possible for me to remove the backgrounds of the buttons on the main menu playlist? How can I enable killstreaks for my m0rehud black? Konceptis it possible for me to remove the backgrounds of the buttons on the main menu playlist? BartenderHow can I enable killstreaks for my m0rehud black? are you talking about the killstreak counter on the ui or what? [quote=Koncept]is it possible for me to remove the backgrounds of the buttons on the main menu playlist? How would I transfer a custom crosshair from ahud into the default HUD. I just want to use the default HUD with only modification being the crosshair, thats it. 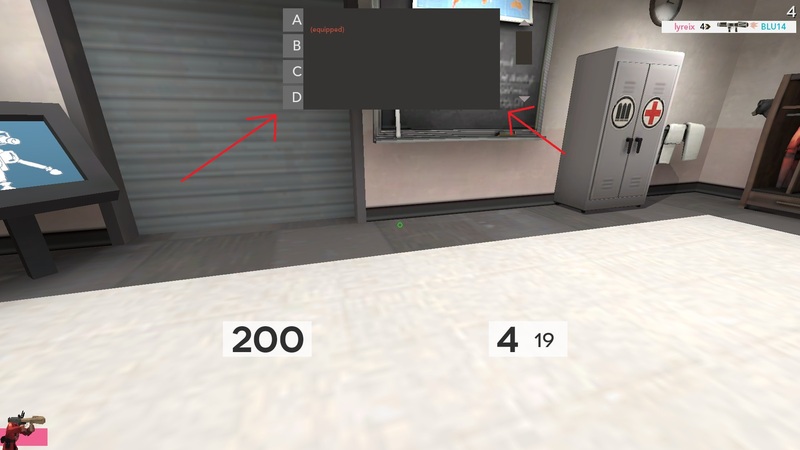 How would I transfer a [url=http://imgur.com/fqizdtO]custom crosshair from ahud[/url] into the default HUD. I just want to use the default HUD with only modification being the crosshair, thats it. you could also get them in tf2_misc_dir in the tf folder, you need gcfscape to open that file tho. Hi, with the hud im using, whenever I'm looking at a person on my team or the other team, the some of the text gets hidden and I can't see the whole number. Anyone know how to reduce the text size?